Luxury Holiday Apartment Llandudno, The Alderley. In addition to 360 Virtual Tours, we also provide web design servies for selected customers as in the case of this luxury holiday apartment Llandudno The Alderley on Abbey Road. The Alderley, on Abbey Road in Llandudno, offers period character and elegance, contemporary style and comfort in this two bedroomed, ground floor luxury holiday apartment. Many original, character features within the luxury apartment have been retained and the tasteful modernisation reflects this. It has been awarded 5* by Visit Wales. The Alderley Holiday Apartment is located approximately just a short stroll from the delightful beach front promenade, Mostyn Cresent, with its Victorian Llandudno Pier, and a safe and clean beach. 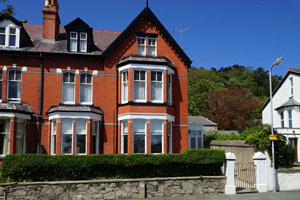 It is also conveniently situated close to the variety of shops, restaurants, cafes, banks and numerous tourist attractions and activities that popular Llandudno has to offer, yet is located on a quiet, well kept road just below the Great Orme rock and its Victorian furnicular tramway, which is a must to ride and offers a charming way to view the resort. Llandudno is the largest seaside town on the north coast of Wales and is on a promentary between the rocky outcrops of the Great and Little Ormes. There are two wonderful beaches, the award winning North Shore, and the quieter sand duned West Shore. A few miles away is the stunning medieval town of Conwy with Conwy Castle standing guard at its entrance. The beautiful Isle of Anglesey is a short drive away and offers a wealth of sandy bays, forest walks and scenic rides. Llanberis is approximately 30 miles away, from where you can take the scenic railway up to the top of Mount Snowdon, the highest mountain in Wales with its breathtaking views. Snowdonia National Park offers a wealth of things to do and see for visitors. Sorry, the Alderley in Llandudno does not accept pets. It is a No Smoking property.